Today, we can order any type of food 24/7. If we don’t want to cook from scratch, we can buy microwave meals from the supermarket, or use a fresh-food service like Blue Apron or Sun Valley. These are companies driven by the concept of healthy, home-cooked meals. They design recipes, supply all the ingredients in the right amounts, fresh, pre-chopped, and ready in an hour, then deliver those ingredients to your door. It’s fast food with a healthy twist. With all these options available, you have to be really committed before you leave the house for a meal. Your determination levels have to be even higher when you have kids, because getting them out of the house is an extreme sport. You have to get everyone dressed, pack all their essentials, struggle with car seats, plan for wardrobe changes, stop for mid-meal (breast)feeding, and survive the car ride, all without killing them … or yourself. Yes, we all love our kids, but traveling with them can be a torturous ordeal. That said, our lives are often so wrapped up in our children that we lose ourselves, especially when they’re little. Yes, the tweens and teens are a different type of trial – shuttling them between activities, malls, and approved friends’ houses. But at least you get some downtime after you drop them off, or while you wait through their practice sessions. Under-fives are a full-time hands-on feat of endurance. And yet you still need time with other adults to keep you sane. And sanity helps you be a better parent. Your ‘adult activity’ doesn’t have to be complex. The simper the better, because complicating things just means extra wrangling with the kids. A nice meal at a kid-friendly restaurant is adequate. The goal of the day is to get the kids to the venue in one piece and get through the meal with minimal fuss and limited injuries. If you – the adult – gets to eat, that’s a bonus. It’s more likely you’ll spend hours arguing about what the kids want to order, watch them swish it around their plates, then eat it up yourself, even if it’s soaked in juice. So … what are the markers of a family-friendly eating spot, and how can you position yourself as one? First, your menu. Even at home, kids are fussy eaters, so you want to serve playful items in small portions, things the little one will enjoy playing with, even if they won’t actually eat it. Your menu also needs to accommodate potential childhood allergies. Keep their kiddie menu simple, colorful, and edible by hand. You should also have kid-size washbasins or bright moistened towels so the kids can wash their hands before they eat. Consider installing a wash-point decorated with cartoon characters. You can even have designated employees, also dressed as cartoons, who will help the kids wash up. Have the hand-basins in plain sight of the seating areas, so that parents can monitor the clean-up exercise. While being family-friendly generally means catering to the foibles of children, the parents need attention too, so make sure there’s some stuff on the menu for them. They might just eat off their kids plate, but at least give them the choice to order for themselves. When parents go out to eat, they’re hoping for good conversation and a meal they didn’t prepare themselves. Relaxation is a stretch – since the kids are still with them – but if they can get a few minutes of peace, your restaurant will score high, and they’ll tell all their friends (and kids’ friends’ parents) to come there. If you can become a birthday party venue, or a class trip destination, you’re set. 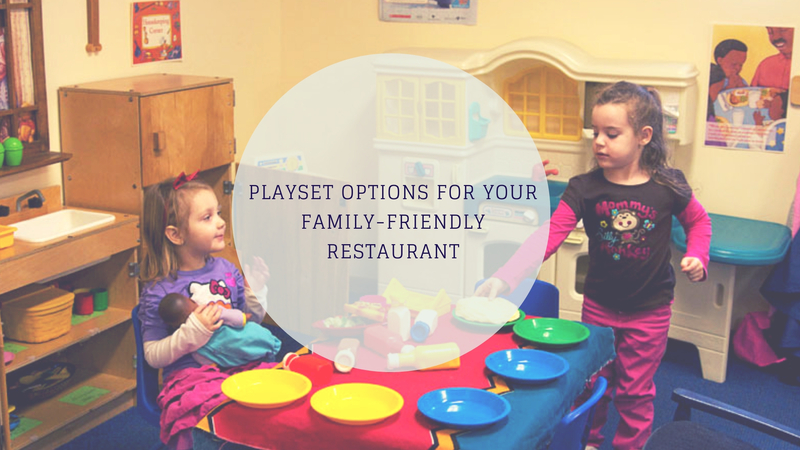 A big part of this is your restaurant’s playground. It needs to be stimulating, safe, and visible for parents at their tables. Put extra effort into your flooring materials, because that’s the main safety assurance. Tightly packed surfaces seem like the best choice, but loose options offer better cushioning, so you should opt for organic sawdust over grass, sand, or turf. Ideally, a rubber mat would be best. Install a modular playset like Premium, a colorful set of units that have towers, rope walls, slides, stepping posts, and bridges. You want a playset that offers varied play options from strength and agility to balance and social interaction. For extra points, get a mixed age playset that caters to different levels of motor skill. If it has quieter spaces for shy kids, and if it’s suitable for differently-abled kids, then it’s a parent’s dream. It should also be large enough to accommodate the children of multiple patrons – at least twenty at a time. Make sure it’s well constructed to hold all their weight, and easy to clean, in case of surprise health inspections.